Our puppies have AKC Champion sires and dams, most born and raised here at SarJan's thus ensuring the quality and health of the dogs we raise. We are currently showing our 10th and 11th generation of home raised companion Shih Tzu. The only difference in the puppy you get and the one we keep is that we will show our puppy to its Championship before (s)he become a family pet just like yours. 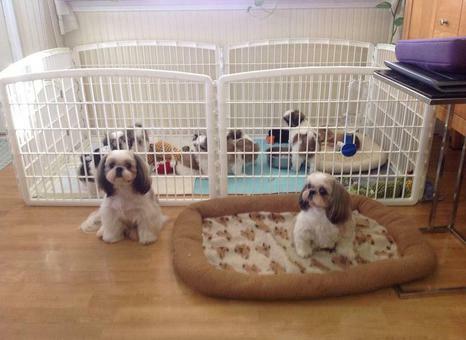 Our puppies are raised in our living room with all the hustle and bustle of everyday life and around the other pets. As soon as they leave the nest they are free to start eating the same dog food their Mama eats. We start giving our puppies baths every week at about six weeks of age. At eight weeks they are evaluated with the Pat Hasting Puppy Puzzle Method to determine whether they will become show prospects or loving pets. They receive their vaccinations at nine, twelve, and sixteen weeks of age. They are wormed before going to their new homes at twelve weeks. We love our babies and want them to be emotionally and physically ready for the transition from our home to yours. At the recommendation of our State Inspector we rarely entertain visitors not well known to us in the interest in protecting our dogs and puppies against infectious and contagious diseases. When someone gets a puppy from us we meet them part way, welcome them to come and meet us at our shop to get their puppy or send them with a pet nanny if a flight is necessary for delivery to their new home. We breed to the AKC standard of 9 to 16 pounds and the puppies will be in that range as a general rule. Since we like 11 to 13 pounds for show that is the approximate weight of all of our adults, though we do have some smaller girls that just make 9. All SarJan's puppies sold as pets are on AKC limited registration and a spay/neuter contract. NO puppies that we offer as pets are sold with full registration/breeding rights. Show puppies available to serious exhibitors only.